West Nassau High School extended its lead in this March 1989 game all thanks to Keith Roberts and his bat. Roberts hit a two-run home run in the sixth inning of the game against rival Hamilton, helping West Nassau on to a 8 to 2 victory, according to The Gainesville Sun. 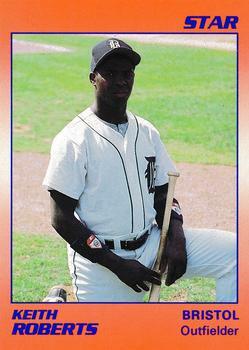 Roberts went on from West Nassau High School in Callahan, Fla., to play in the pros. His pro career, however, proved brief. He played a single season, never making it out of rookie ball. Roberts' career started and ended in 1990, taken by the Tigers in the 42nd round of the draft out of West Nassau. With the Tigers, Roberts was assigned to rookie Bristol. He got into 42 games there, but hit just .170. He picked up 15 hits, three doubles and a triple, marking the extent of his pro career.